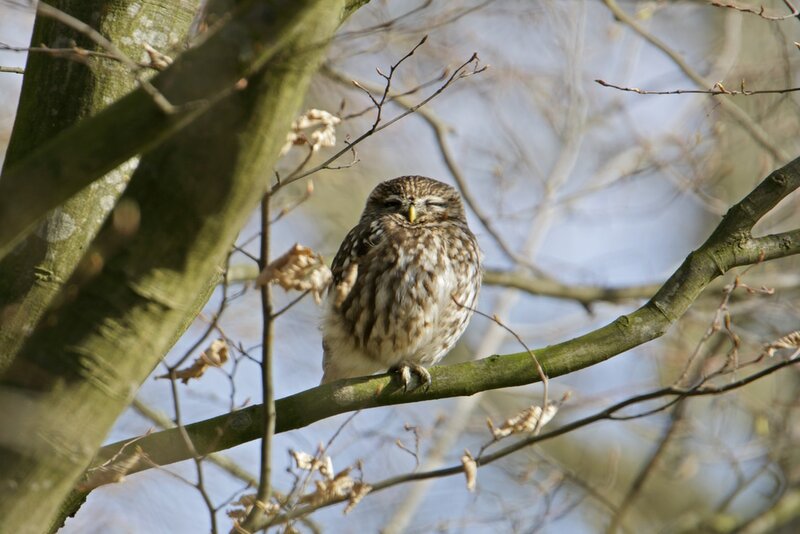 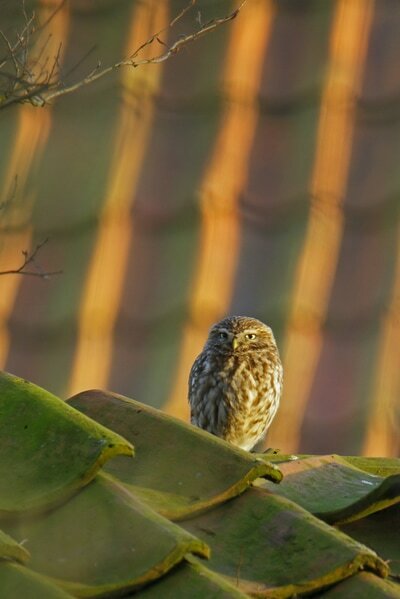 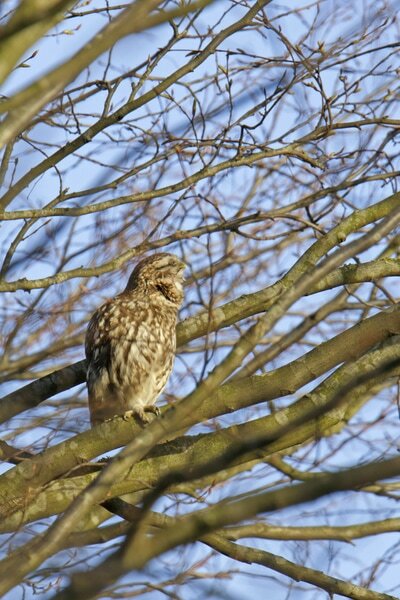 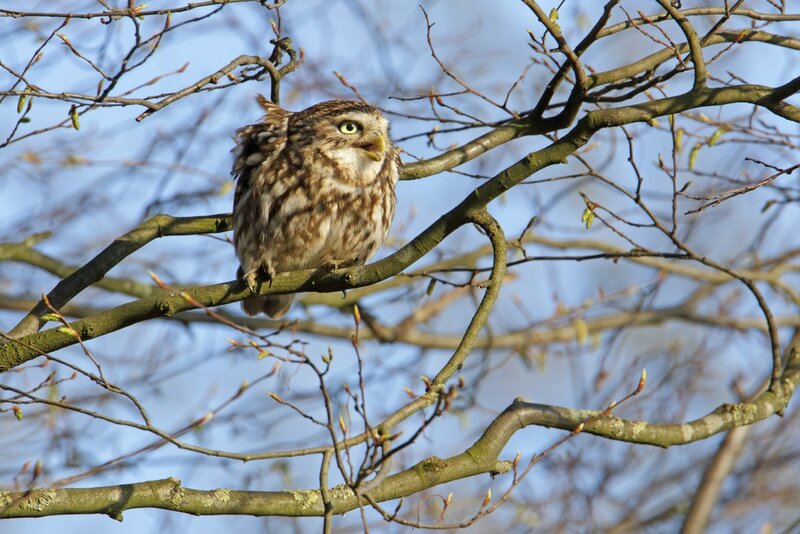 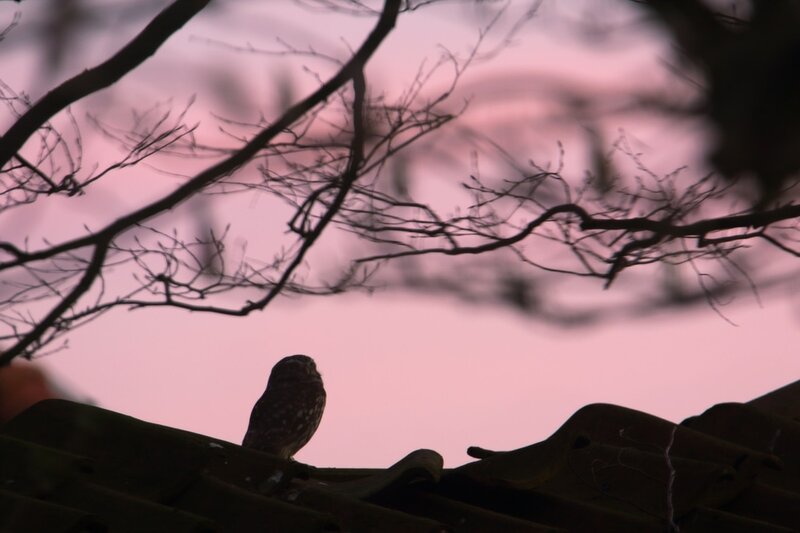 Since at least 15 years, I hear them scream & shout in the early evenings and very often in the morning when I had to leave to work.....the Little Owls. In 2007, from a colleague I received a birdhouse for this bird species which I placed in a birch tree at the end of my garden. 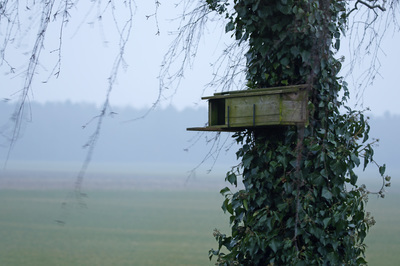 Nothing happened around the birdhouse until 2015. 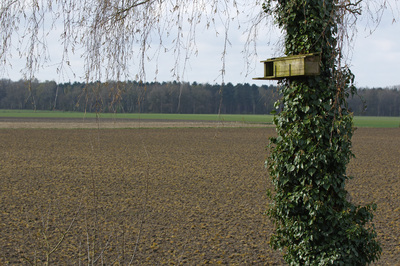 Since then the birdhouse is popular during the courtship period. 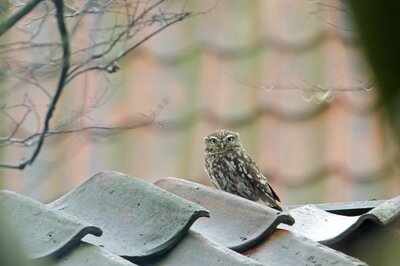 For more than 3 months I saw them every day until 7th April, the day/evening my neighbours organised a big garden party for a lot of people who were hanging around near the favorite owls place making a lot of noice. End of the owl story 2018! 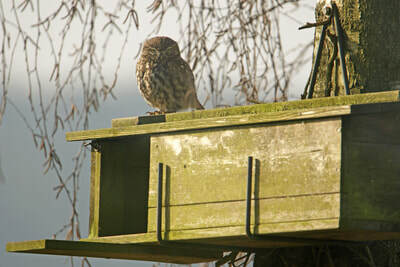 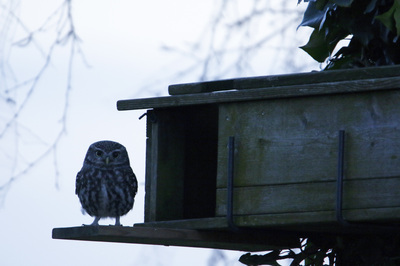 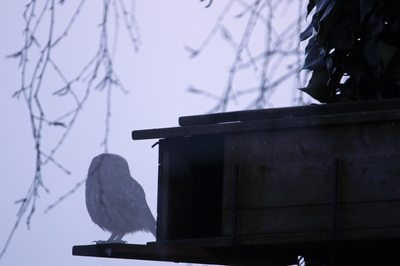 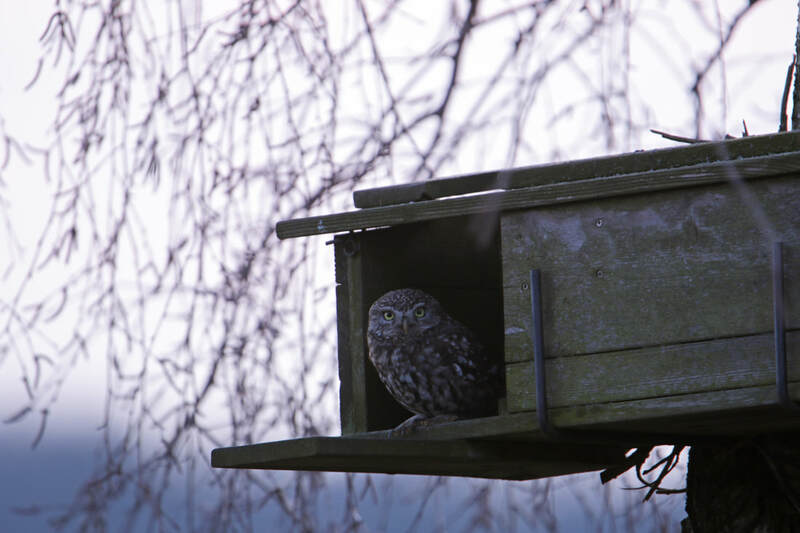 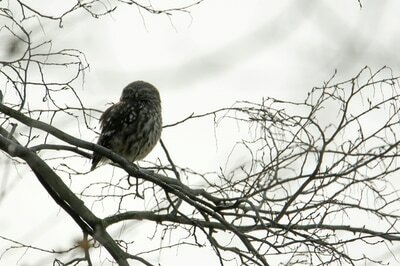 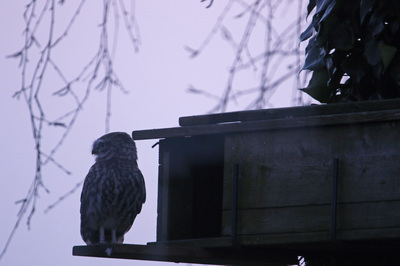 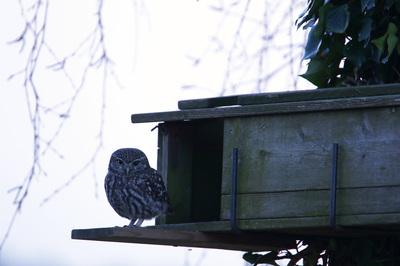 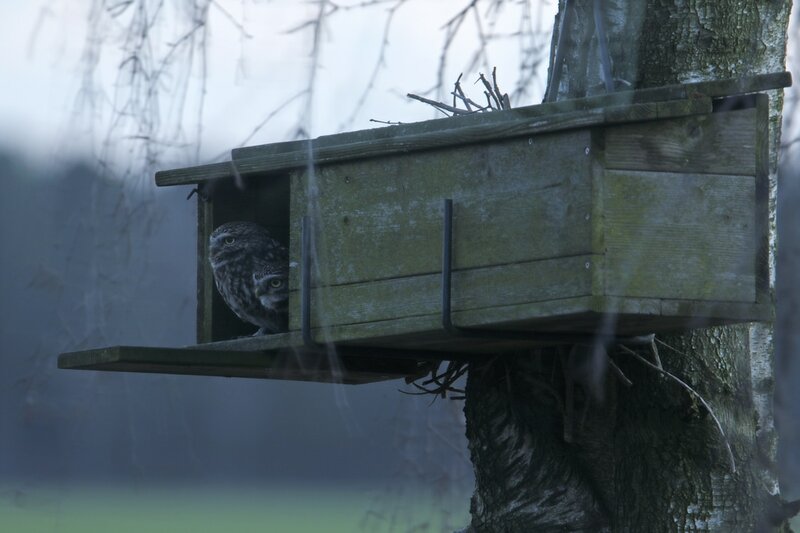 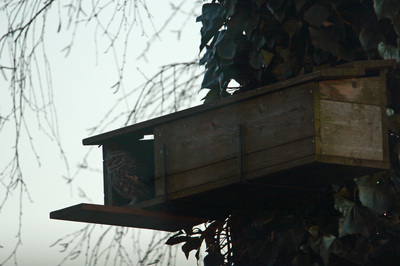 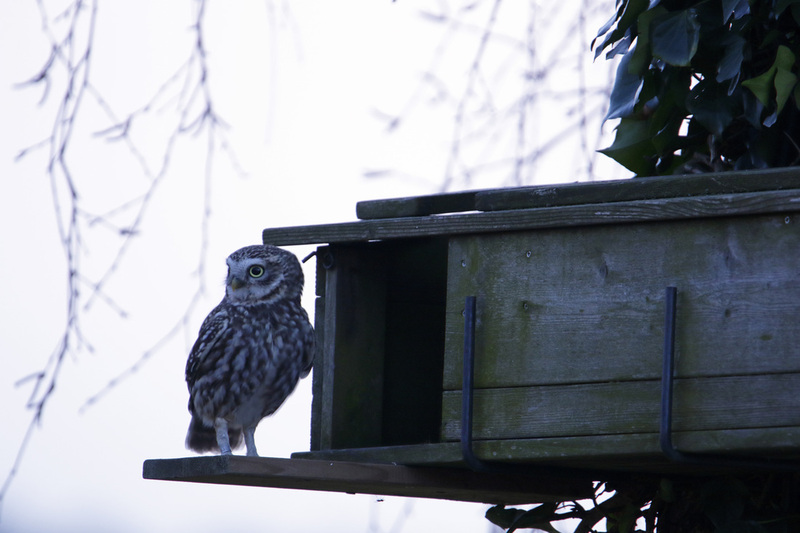 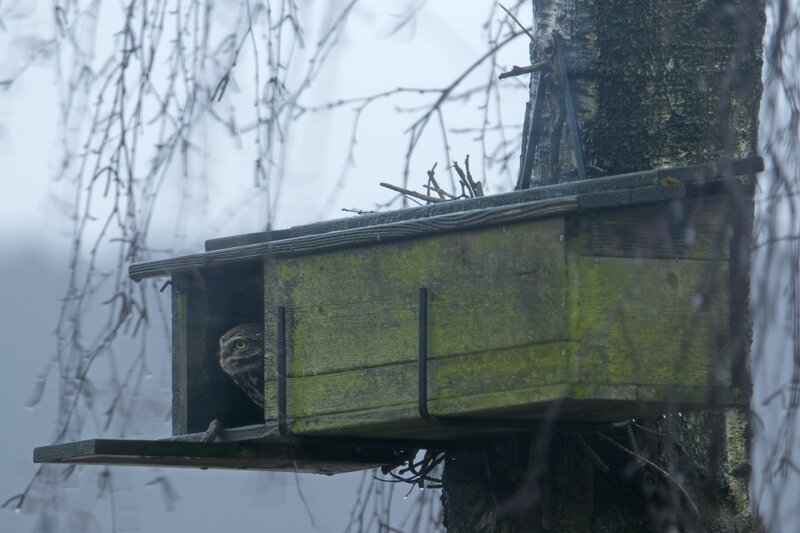 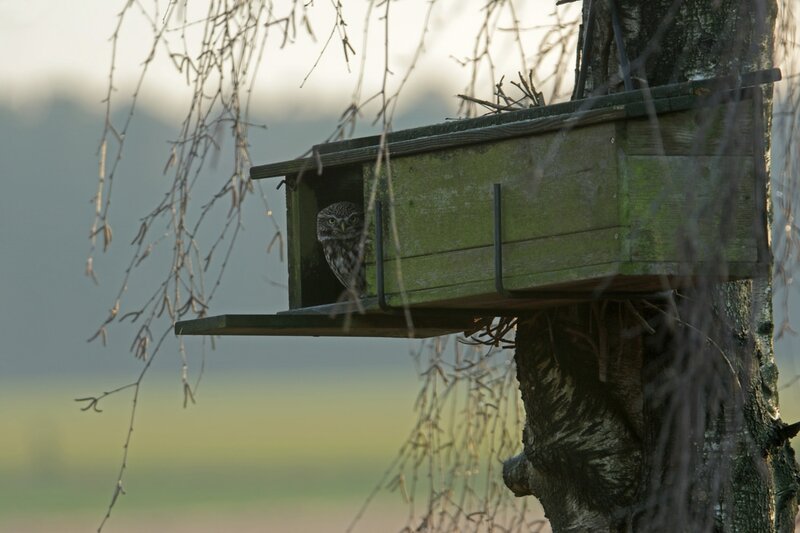 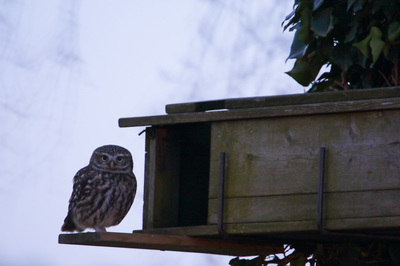 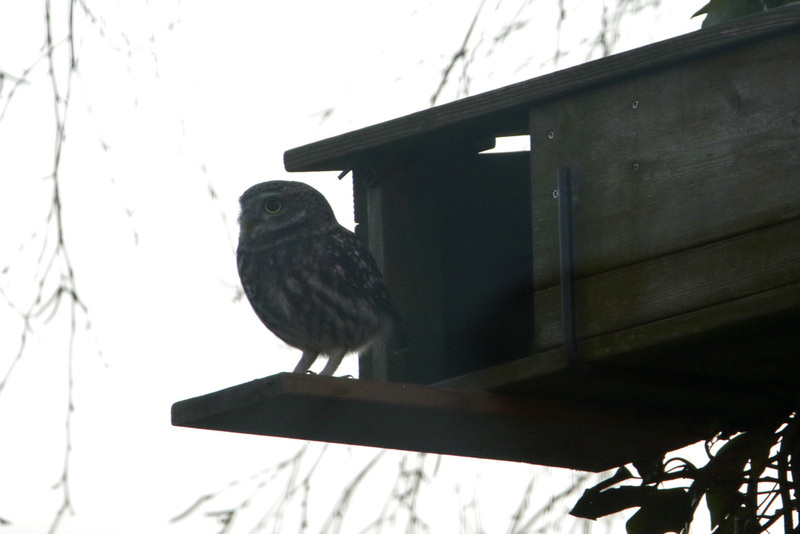 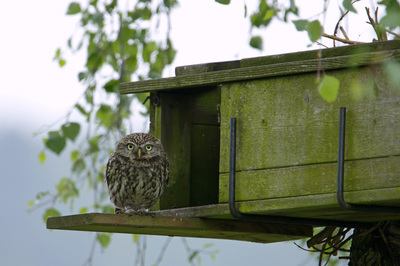 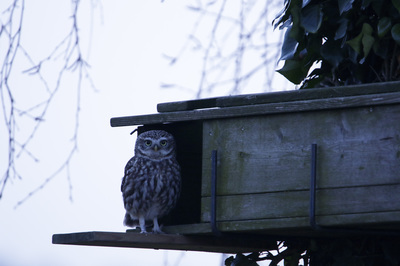 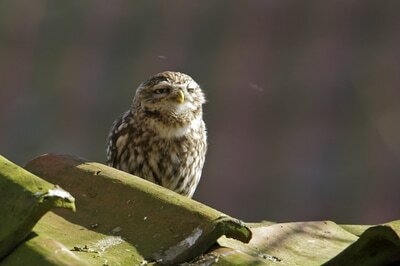 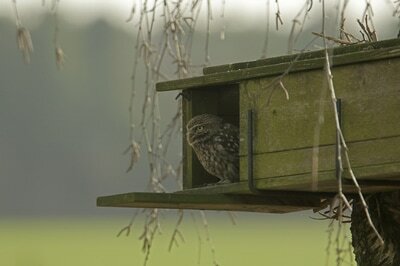 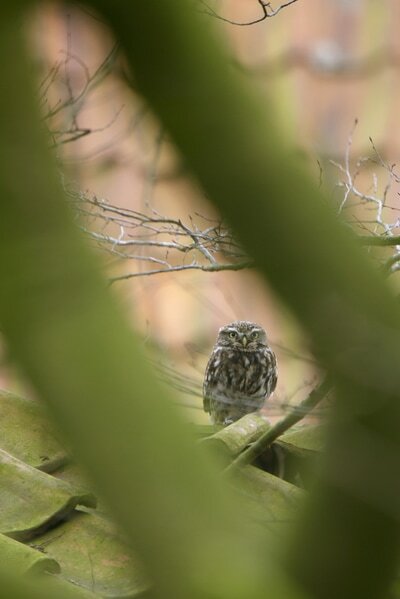 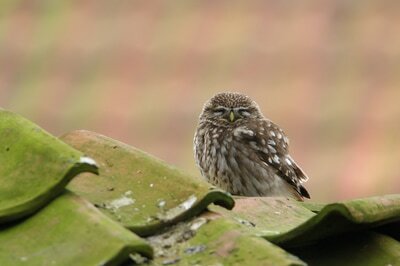 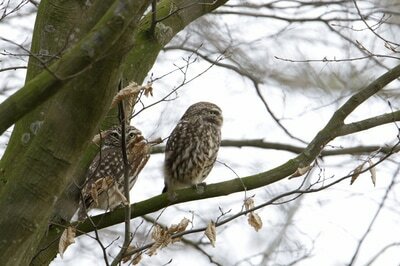 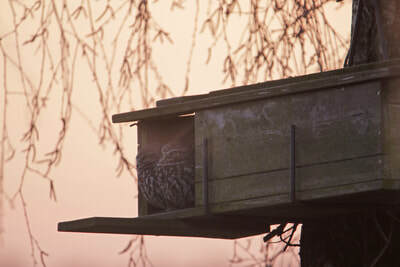 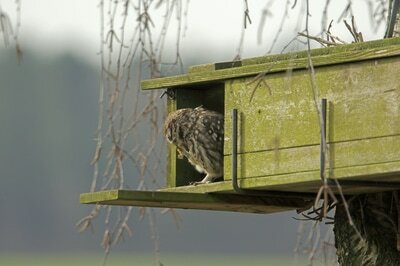 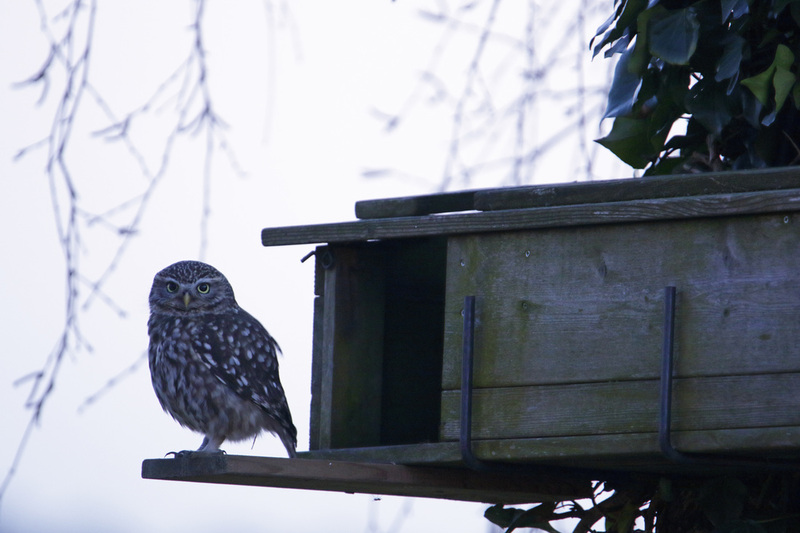 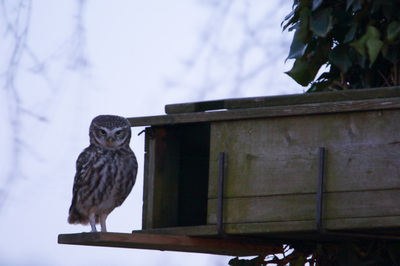 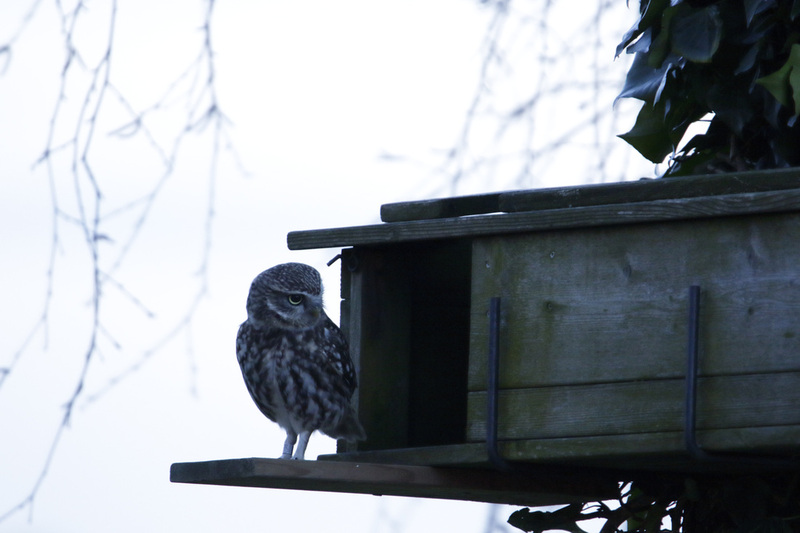 On February 28th, I noticed a Little Owl in my birdhouse. 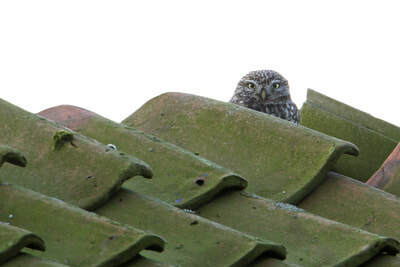 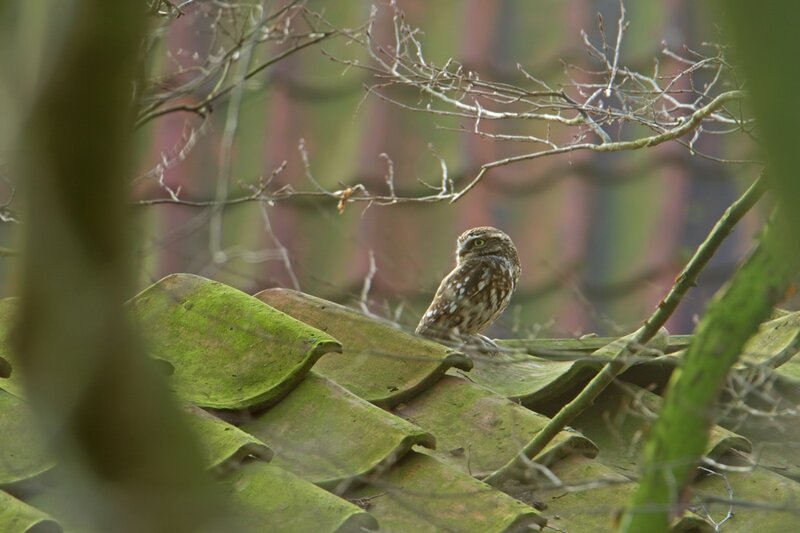 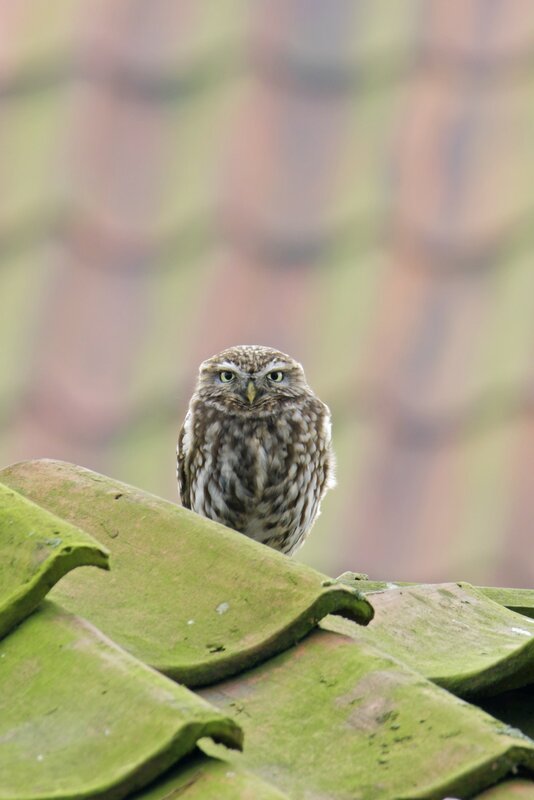 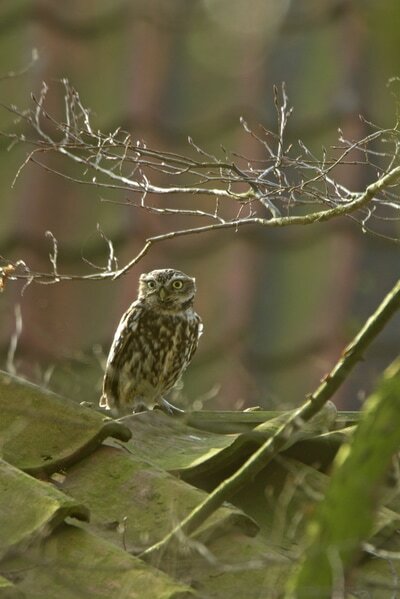 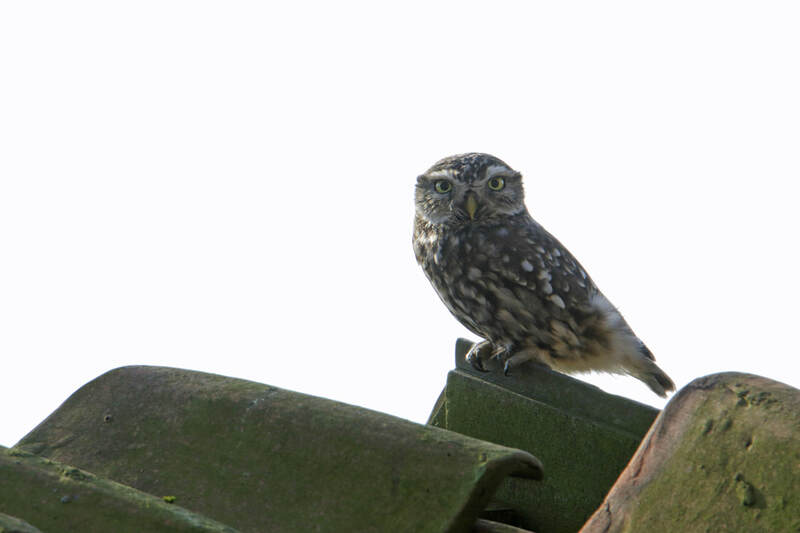 A few days later I saw the Little Owl on the roof of the derelict garden house of my neighbours which I can see from my kitchen. 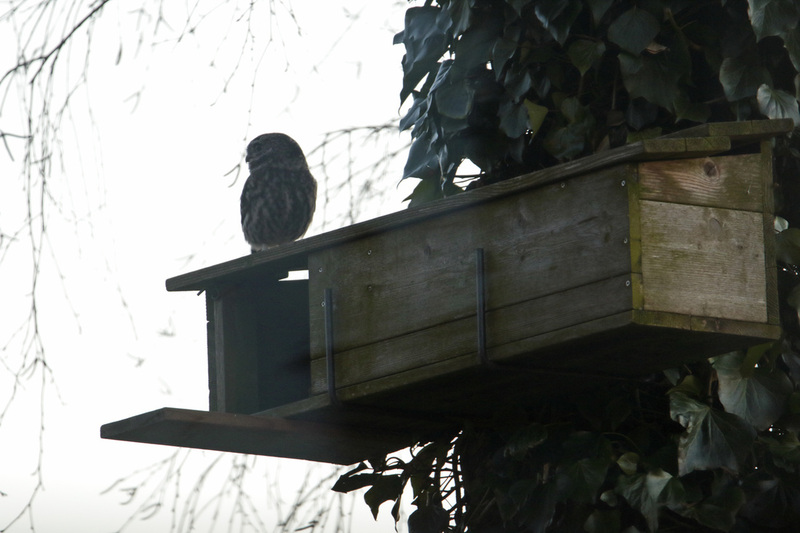 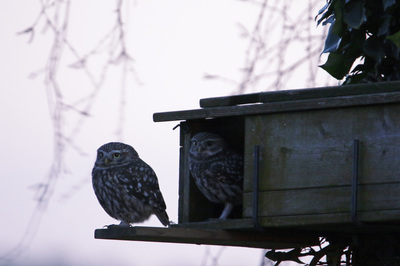 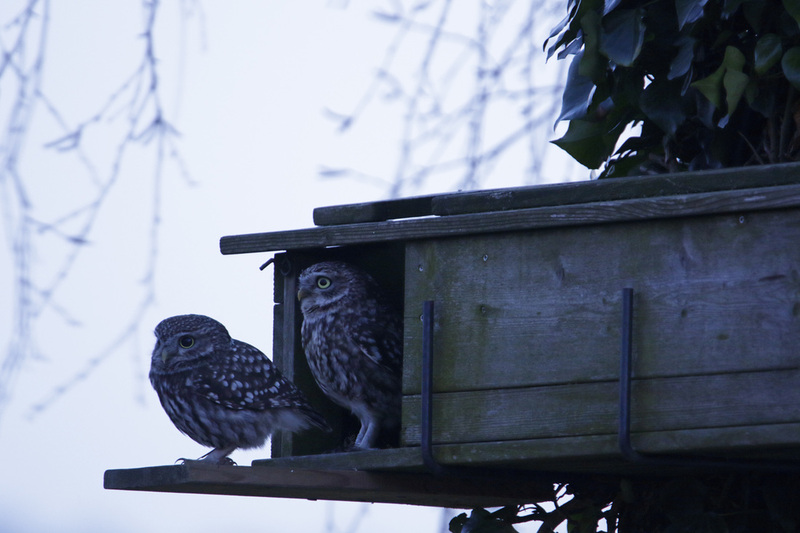 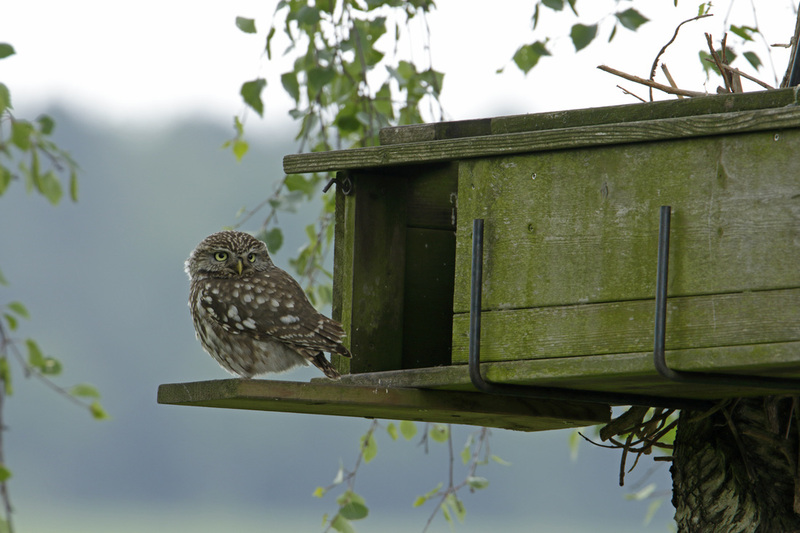 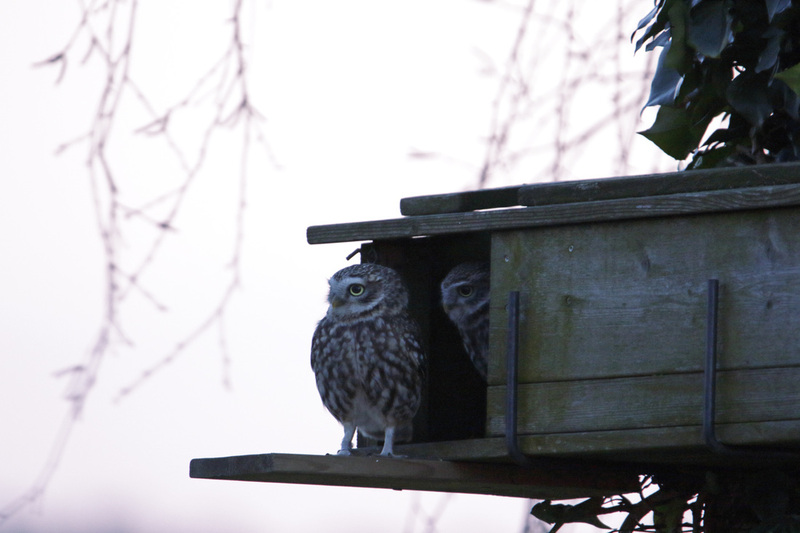 As from a distance all Little Owls look similar, I first thought that there was only one owl using my birdhouse but one day after work I saw two Little Owls resting on the roof of my neighbours. 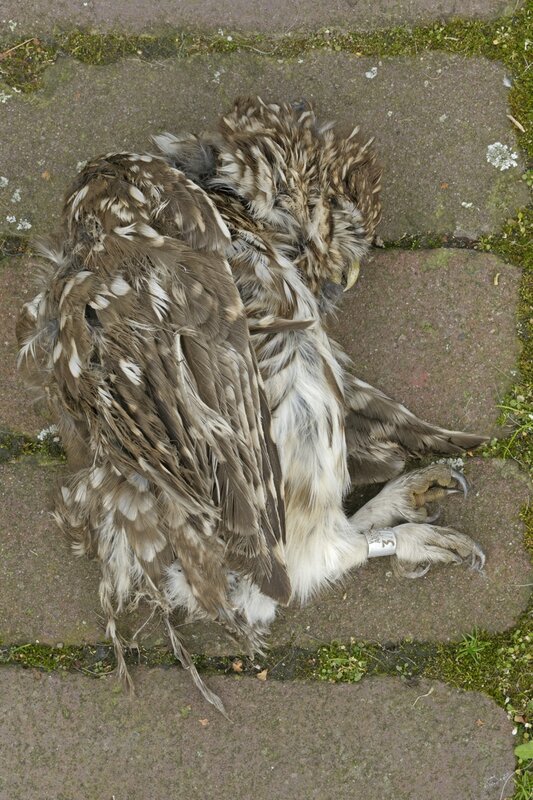 Both owls are ringed on the right leg but one ring is placed upside down, for me the identification mark. 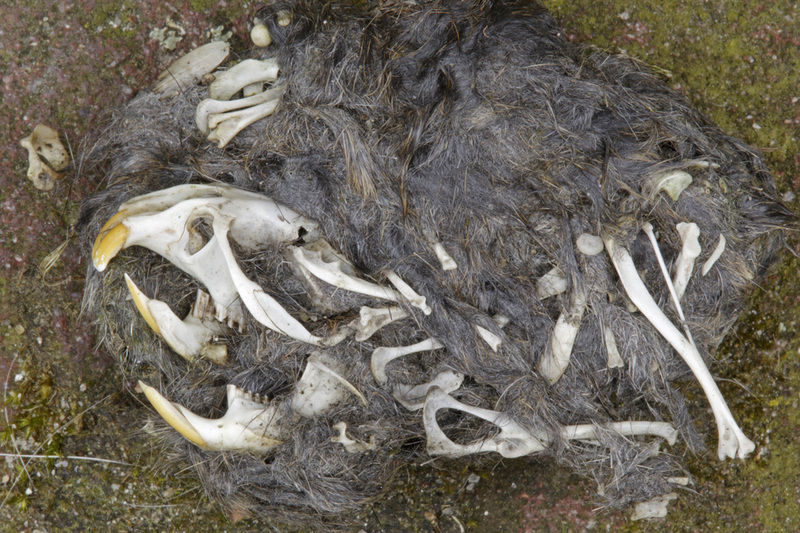 The ring placed upside down was very difficult to identify as the script part now comes first and the numbers are only partly visible through the feathers. The owl with the readable ring is the same owl as last year (3.764.005). Later I was able to decode the second ring and found out that this owl (I guess the male) was ringed in Belgium. After a rainy period they both preferred to cuddle between/under the roofing tiles. 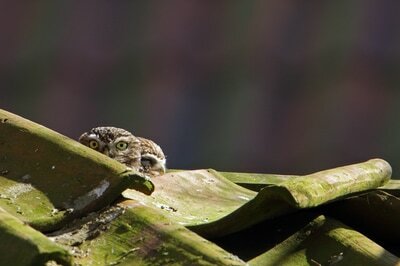 As they both prefer the roof, I expected them to breed between/under the tiles. 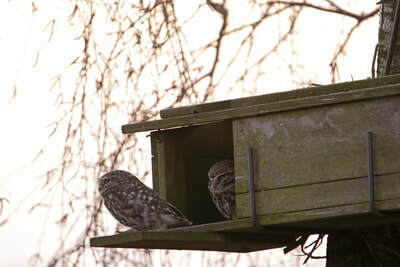 On Monday 27th March they were suddenly gone. 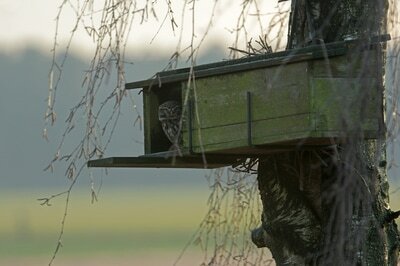 Just a few times in the dark I saw the male on the roof so I assumed that they had choosen the willow to breed in. 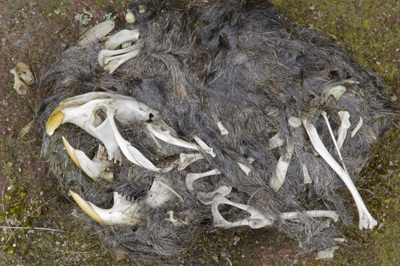 On April 2nd I saw a wing under the sand of the acre and found the female owl dead.....very sad and probably the end of my owl story :-(. 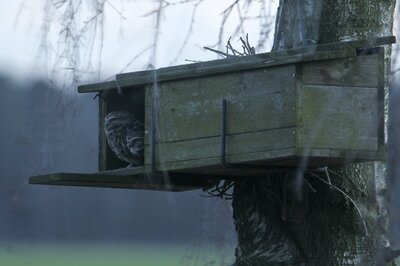 Although.....the Belgian owl is still around and shouts for a (new) partner. 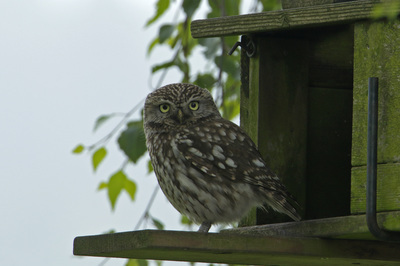 The little owls of last year choose again an other birdhouse for breeding but I have a new visitor. 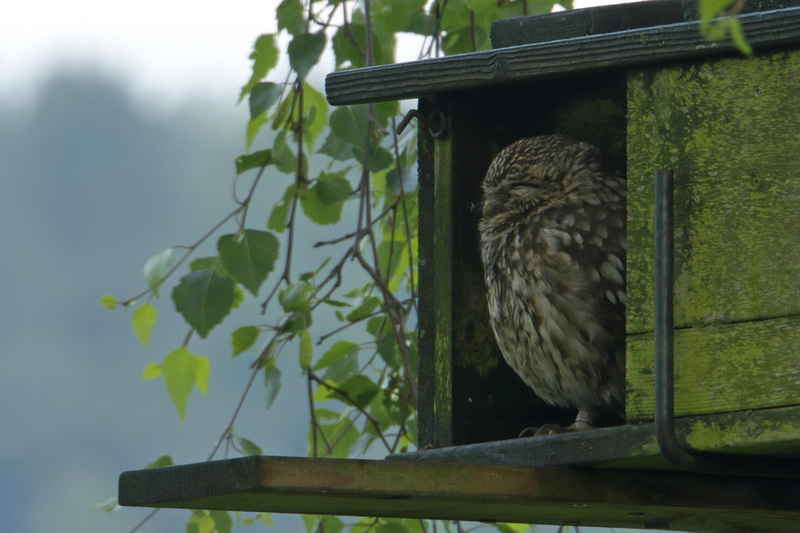 Sometimes this young little owl, born in 2015 as I learned after I had the complete ring number (3.764.005​) visit my birdhouse at day for hunting/hiding/sleeping purposes. 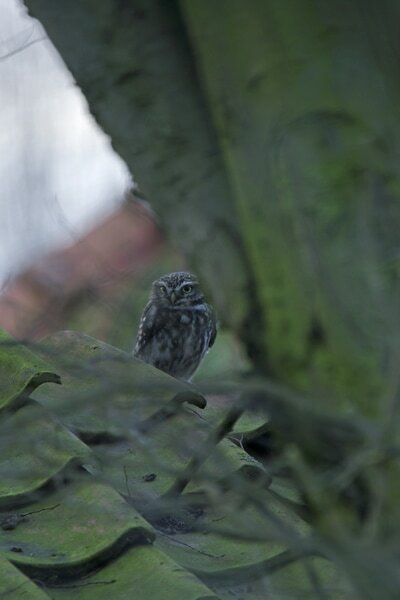 I'm not sure if he/she has a partner but I'm happy that I can see/photograph this little owl at day with normal light conditions. 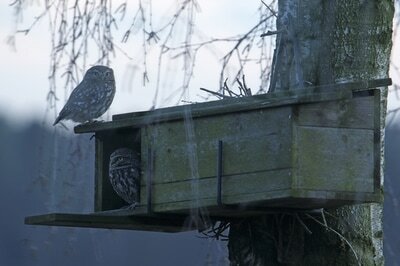 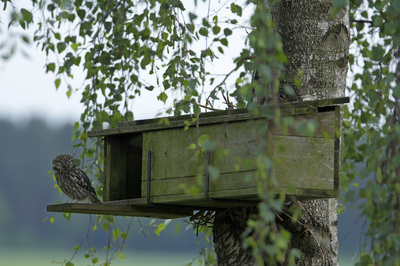 After 8 years of waiting, it seems that this year the owls had choosen my birdhouse. 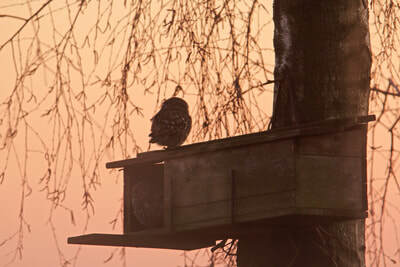 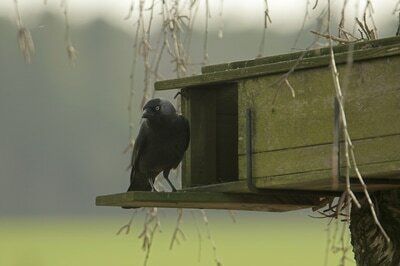 Almost every evening (when it's almost dark) between 7th March and 8th April, they payed a visit to the birdhouse. 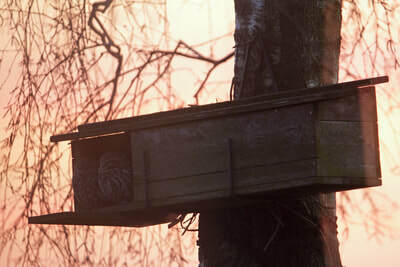 The male owl comes first and calls for the female. 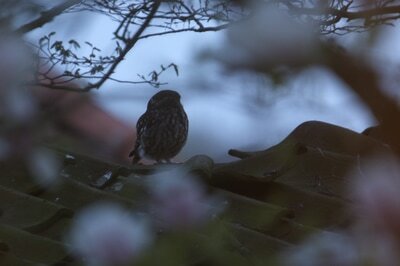 Within a minute she (3.661.813) appears. 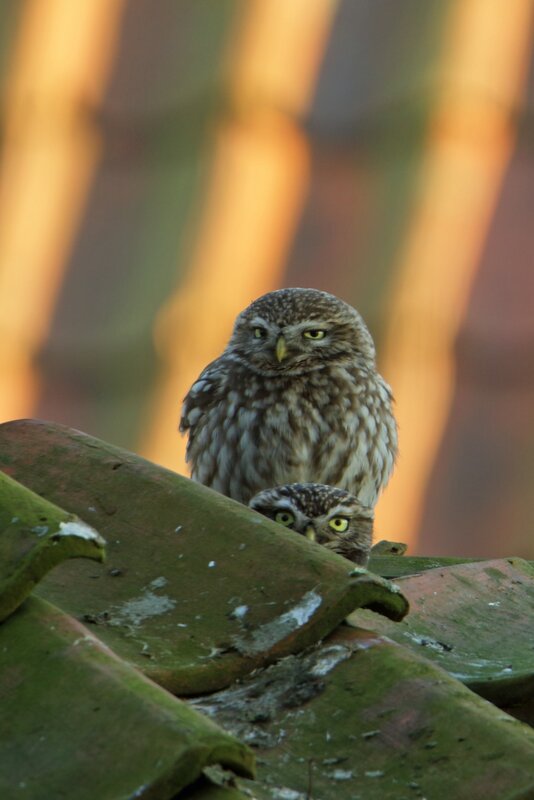 As I did not want to disturb them I started photographing them through the window as you can see on the first pictures below. 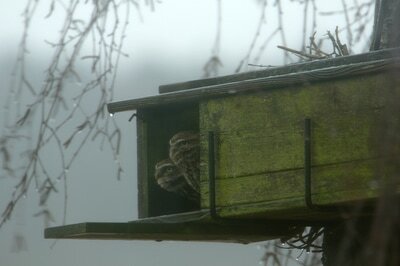 Later I photographed them through the open window on the first floor. During the day or with daylight I have never seen them so photographing them in the dark is a real challenge as I have very long shuttertimes. On 7th and 8th April they came together and stayed much longer in and around the birdhouse and it was obvious that they would move in soon. 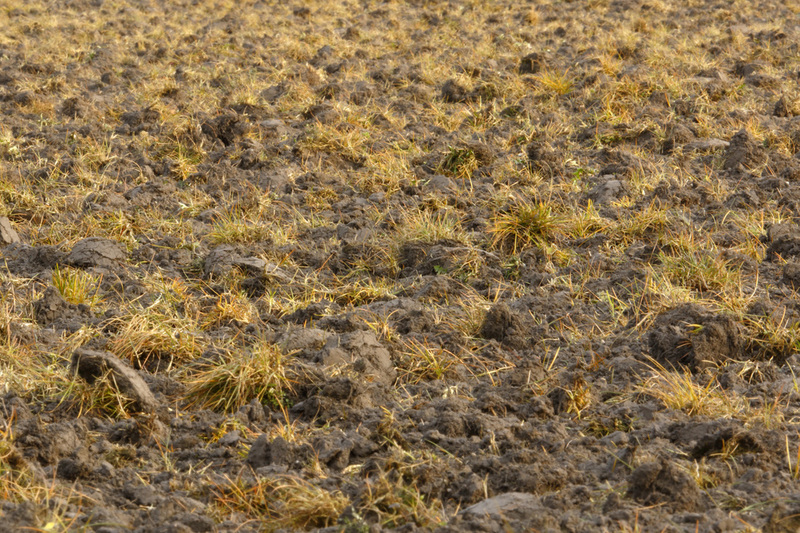 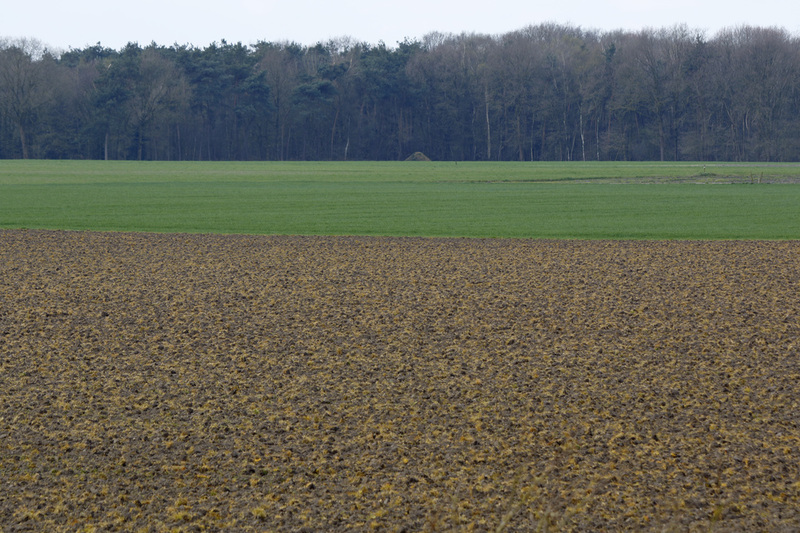 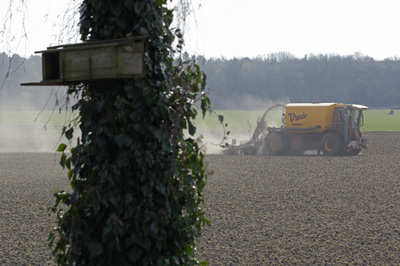 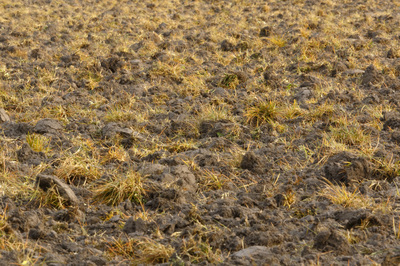 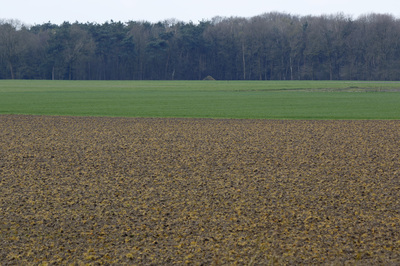 But, on Thursday 9 April the complete farmland was ploughed and changed from a green into a brown field and with this action it lost its function as food resource. 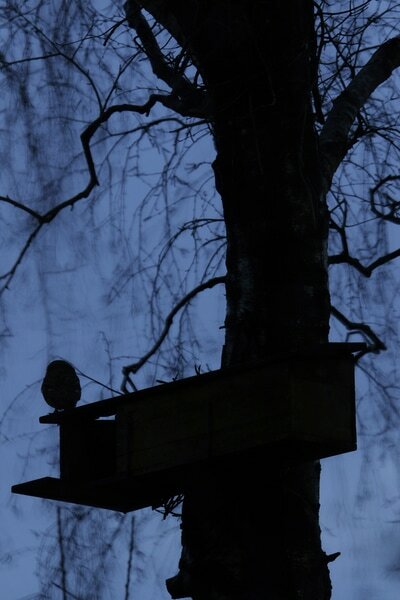 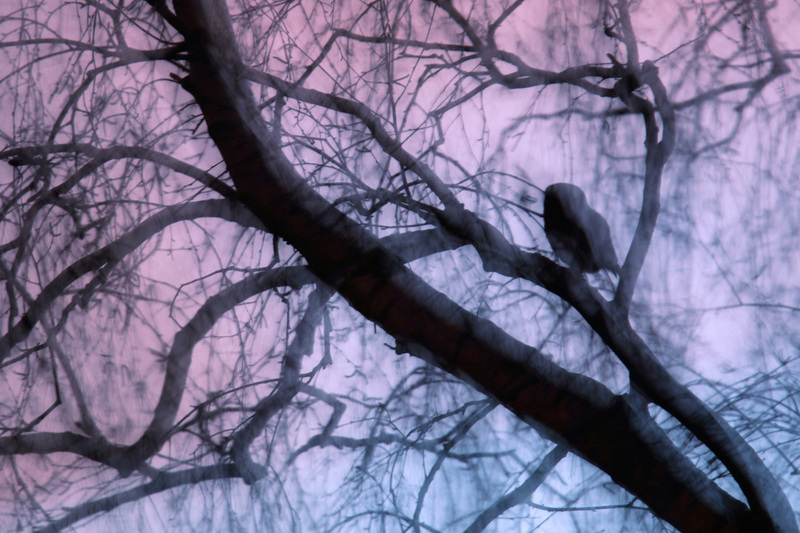 In the night from the 9th to the 10th April I heard the owls for the last time and since then they did not return.